For further reference, check out our Night Sky Calendar and Night Sky Guide. Free monthly sky maps can be obtained from Skymaps.com. Hands-on learning, even in astronomy. At most other colleges, students majoring in astronomy and astrophysics have to leave campus to observe the night sky. But not at Widener University. At the Widener University Observatory on our main campus in Chester, students in our physics department use a 16-inch computerized Meade Cassegrain reflecting telescope and several, smaller, 12-inch telescopes to get first-hand experience viewing planets, stars, nebulae, clusters, and galaxies. We like to share the fun with amateur astronomers in Chester and neighboring communities in Pennsylvania, New Jersey, and Delaware. During the fall and spring we offer public telescope viewing sessions every Monday at twilight and star-gazing every first Friday evening of the month. Each session is supervised by a Widener University astronomer, assisted by a student. Widener is also happy to host special group viewing sessions for budding astronomers of all ages. Widener’s Observatory, along with the Wolfgram Memorial Library, Widener’s Art Gallery and the PMC Museum, are part of what makes Widener University a great choice for undergraduate and graduate studies. Curious about what else Widener has to offer? Schedule a visit to learn more about the University Observatory at Widener. Interested in monitoring real-time sky conditions? 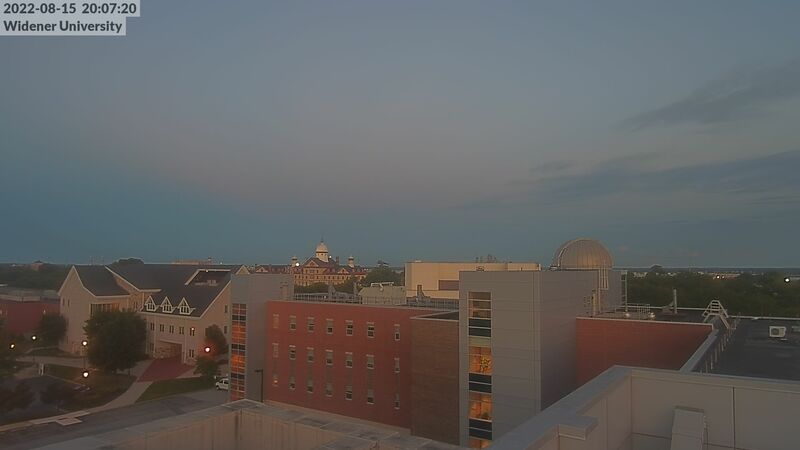 Visit wunderground.com to see Widener's live weather webcam on top of Kirkbride Hall, explore current weather conditions, and view 24-hour video timelapses.